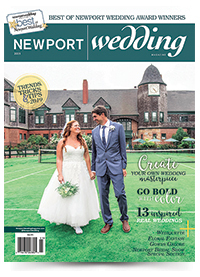 "Congratulations on another terrific Newport Bridal Show! It was very well attended and we were very pleased with the number of brides that registered with us." "Kudos on another fantastic show! I think the crowd this weekend was the best I've seen (the weather certainly helped)! I spoke so many great couples that I actually ran out of entry forms for my basket giveaway!" -Ann Petronio, Owner of Annie's Escapes, Inc.
Pictured above: F. Mike Henriques, Artistic Director & Lead Filmmaker, Artistic Wedding Films and John Edick, Owner/General Manager, Blackstone Caterers.